Congratulations! 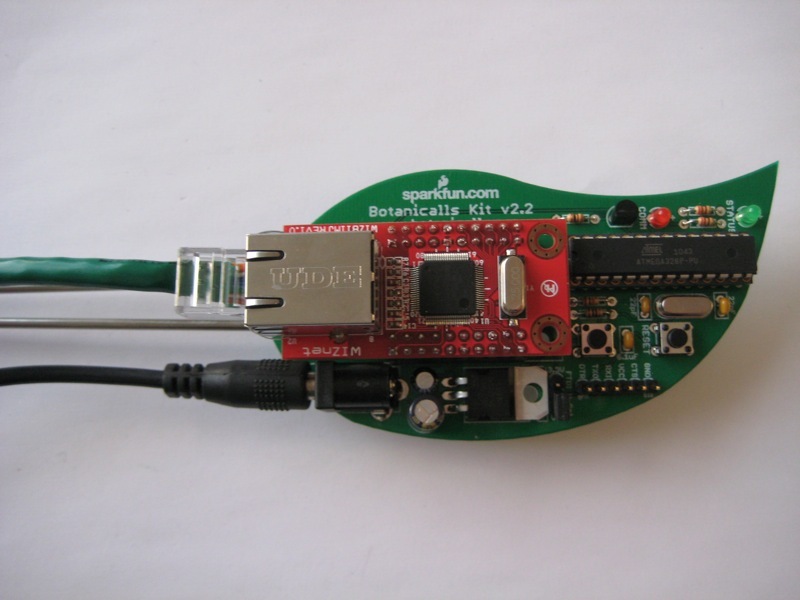 Now that you’ve assembled your kit, you’re ready to test and install your Botanicalls system. You will need a regular Ethernet cable to connect Botanicalls to your router. Your kit already includes a power adapter. Take the ethernet cable and plug one end into the WIZ811MJ Ethernet adapter, and the other end into your network hub or router. Plug the power supply into an electrical outlet and then insert the barrel plug into the power jack on your Botanicalls board. The green and red lights on the XPort will begin blinking immediately. After about ten seconds, the red COMM light on the board will blink several times, followed by the green STATUS light. If this does not happen, don’t panic. Help is available in the Forums. Insert the moisture probes into the soil about halfway between the edge of the pot and the stem of the plant. Leave at least two inches between the soil and the bottom of the board, so that the plugs are well above the dirt. Make sure the probes aren’t touching each other, otherwise your moisture readings will be incorrect. Plug the Ethernet cable and power in. Long (25ft), very long (100ft), and even ridiculously long (300ft) Ethernet cables are readily available if you need one. If the soil is moist you will see a steady bright green light after start up. If the soil is dry you’ll see a dimmer light that blinks every 10 seconds. Press the TEST button one more time and check your plant’s Twitter page to see the approximate soil moisture. Your leafy pal is now a Botanicalls plant!